Peter Malinoski’s guitars exist somewhere between the old and the new; they belong in the past, present and future. His instruments are a fresh step back and beyond the roots of electric guitars that represent what they could have been and still can be when mass production and mass marketing are taken away. They are a nod to the hand-built techniques of a singular craftsman where all design and construction ideas are considered to create unique instruments that become something refreshing and new. The look of a Malinoski Guitar is different from anything else while still in touch with the shapes and forms of traditional guitars styles, both electric and acoustic. They are of a design that emphasizes the qualities of the materials as well as the construction- an aesthetic of pure unadorned beauty. Malinoski Guitars also embrace the simple elegance of hand-wound magnetic pick-ups and creative switching, complete with passive piezo transducers to give these instruments wide tonal palettes- more than you would ever expect. Malinoski Guitars are heirloom instruments you will want to play. They are instruments you will want to take to a gig because they play so well, sound so good and cover so much ground. Rebel Guitars is an authorized dealer of Malinoski Art Guitars. 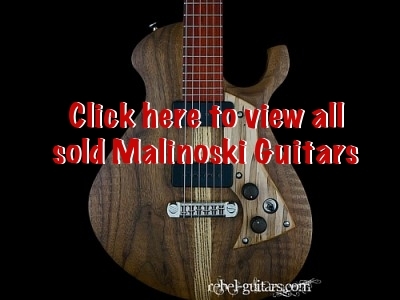 View the Malinoski Guitars we’ve sold.